Tristan's mother thinks her son needs to learn a lesson. That's why she decides to take away his phone, his wallet and his car. She drops him off at a remote cottage that has no luxuries and gives him an allowance that will cover food and not much else. He's supposed to stay there for a couple of weeks and the aim is to make him realize that he needs to make something of his life. There's one person he's allowed to contact, a girl he doesn't know named Michelle. Tristan is a spoiled brat and he needs someone who's strong enough to tell him the truth. He also needs some lessons to acquire basic life skills and Michelle is the perfect person to help him with that. Tristan finds her incredibly attractive, but they're from different worlds, so it could never work between them, or could it? 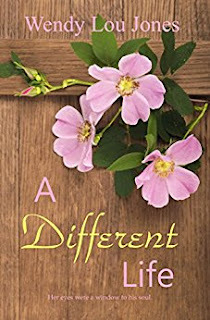 A Different Life is a wonderful story about two people who haven't found much happiness in their lives yet. While Tristan's parents are rich. He's never given money a lot of thought and takes the means to allow excessive spending for granted. Tristan seems lucky, but his life is empty. Michelle grew up being poor, but having a loving family made up for the lack of money. She doesn't have much income now either, but she makes things work, even when her wallet is practically empty. Her heart was broken by someone years ago and she hasn't let anyone in since. She deserves a break and I hoped she would get a chance to be young again for a while. Tristan and Michelle are both amazing people and I loved them from the start. They have fabulous chemistry and their love story is original and interesting. Wendy Lou Jones always writes honest books about real life. She doesn't spare her characters and that makes her stories realistic. She has a beautiful distinctive writing style and I enjoyed reading her unique combinations of words. I loved the creative beginning of A Different Life and think Wendy Lou Jones has a great sense of humor. Her story is emotional, but it's filled with many surprises as well. The main characters have fascinating personalities. Tristan and Michelle are both vulnerable and are trying desperately to protect themselves and the person they love. They want to be brave and are striving to make things perfect, but because of that they don't always make the wisest decisions. This leads to many moving scenes that made me want to keep reading. I read A Different Life in one sitting, I couldn't put it down and I was completely mesmerized by the stunning heartwarming romance. The Echoes of Nut Hill series is amazing and A Different Life is another terrific book by Wendy Lou Jones that can easily be read as a standalone. The characters are all fantastic and they have a special place in my heart. I highly recommend this charming, moving and incredibly romantic series. My word you can read fast. Thank you so much for a lovely review, Suze. It's always so nice to get a good one first. Can I breathe again now? I love the idea of this story, it is different from anything I have read before. Great review! I need to read this author! Thank you for posting. I absolutely have to try this author. Thank you for your enthusiastic review and for the introduction as I was not familiar with Wendy Lou Jones until now. It sounds like a sweet story! Wendy Lou's covers are so pretty! As you know I am a big Wendy Lou fan and thus sounds like another great book. This book sounds very good and I love the book covers. I love this idea the of reform.